Ten years ago Mira Rai was a teenage guerrilla, wanted by Nepal's government. Now she's the country's most successful runner. Behind a steel gate on a dusty side street in Kathmandu, there's a rather good bar. It's run by the Belgian consulate and offers a superb selection of rare Trappist beers. It's an odd place to meet Nepal's next sporting superstar, a former child soldier who ran away from home to escape a life of repression and has since risen to the top of one of the most extreme sports on Earth. Two things strike you upon meeting this young athlete. First, there are those eyes - twinkling with self-amusement at an absurd life. Secondly, there's the fact that Mira Rai is a woman. Nepal has a shocking record on gender equality. The World Economic Forum puts the Himalayan republic 121st out of 136 countries in the Global Gender Gap Index, and women here are considered paraya dhan - someone else's property. Violence against women is rife, and Nepal's long-awaited new constitution denies unmarried females the right to pass on their citizenship to their children. It makes the fact that Nepal's new international sporting hero wears a skirt even more extraordinary. In the village of Sanu Duma 9, high in Nepal's eastern region, opportunity never knocked for girls. While her brothers went to school, Rai was expected to stay at home and do the chores. Then she was supposed to get married and have children. Rai, however, had different ideas. "I would run to the market - three hours away - buy sacks of rice, then run back and sell them for profit," she says, flashing that wry smile. She forgets to mention that the bags weighed 28kg (60lbs), and she was just 11 years old. By her mid-teens, she had become what parents refer to as a handful, but while a rebellious streak in a Western 14-year-old might manifest itself as a matt-black bedroom or unsanctioned piercings, Rai expressed her defiance by joining Nepal's Maoist guerrillas. "I told my mum I was going camping," she shrugs. "I didn't contact her again for seven months." It was then that she learned that her mother had attempted suicide in her absence. "She couldn't face doing the chores," jokes Rai, but that throwaway comment reveals the steeliness that has taken this waif-like 26-year-old to the top of her game. When Rai enlisted in 2003, the Maoists were on the run. The Nepalese army was hot on their heels. Summary executions, torture and disappearance were rife, and Rai describes a time of "constant uncertainty" that was "always dangerous". But what impressed this impossible child most were the insurgents' sports facilities. "They had football, volleyball and athletics," she says. "Amazing opportunities." When the war ended in 2006, she joined a government rehabilitation programme and continued running for fun. Her first race was a 21km event. With no money for food, she ran on an empty stomach and collapsed 400m from the finish line. When she moved to Kathmandu, charity from a kindly karate teacher allowed her to keep running. Coached by telephone, she would train on the capital's ring road - one of the most polluted stretches of tarmac in Asia. 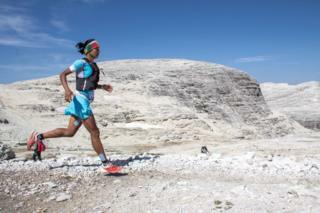 Then she discovered ultra-running - gruelling races of up to 80km or more in the extreme mountain terrain. Her first race - a 50km event in the Kathmandu Valley - was in March 2014. True to form, Rai turned up hungry, wearing trainers that cost $4 (£2.60). Japanese runner Miki Apreti recalls a "smiley, woefully under-equipped girl, like an elf running in the jungle". Halfway round, on the point of collapse, Rai borrowed 50 rupees (50 cents, 30p) to buy noodles and a carton of orange juice. And then won the race. Event organiser Richard Bull knew instantly he had found a prodigy. "I asked her what she needed to continue training," he says. "She just wanted money for food." At Bull's instigation she then entered and won Nepal's 200km Mustang Mountain Trail Race. Then Bull hatched a plan to send her to compete in Europe. "It was a fraught time," he says. "Her visa arrived just six hours before she was due to fly. Then we realised she'd never been in an aeroplane before." But Rai took it in her stride, winning her two races. Victories in Hong Kong and seven other events followed. This year she entered the 82km Mont Blanc Skyrunner World Series. It's one of the toughest races in the world and she breezed it, coming home 21 minutes ahead of the runner up. With a sponsorship deal and the potential to become the most famous Nepali after Sherpa Tensing, Mira Rai's future looks increasingly dazzling. She giggles at that notion, but her smile is tinged with incredulity. "I began running to escape my future," she says.